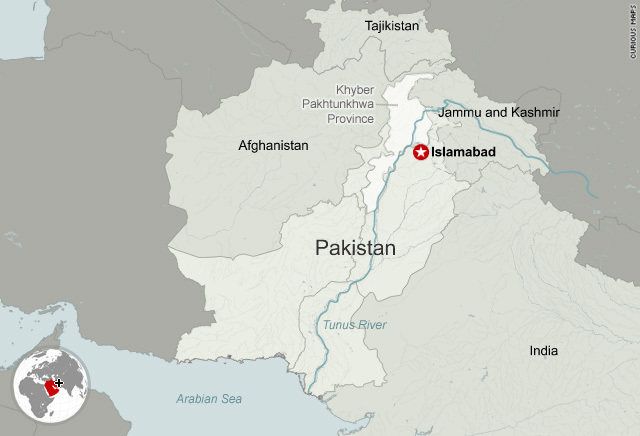 Islamabad, Pakistan (CNN) -- Intense rain and gushing flood waters threatened Wednesday to cause more misery in monsoon-bloated Pakistan, where 3 million people are already suffering. U.S. Secretary of State Hillary Clinton urged Americans to donate to relief efforts, saying that experience in post-earthquake Haiti showed that small donations can make a big difference. Pakistani Prime Minister Yousuf Raza Gilani appealed to residents to curtail expenditures for Ramadan feasts and upcoming independence day celebrations and contribute instead to help their desperate compatriots. As many as 1,500 people have died in Pakistan's worst flooding in 70 years. Relief agencies were struggling to reach people who have lost everything to walls of water. Many were cut off after roads and bridges washed away. Thousands of others were people already displaced by violence in Pakistan and neighboring Afghanistan, according to the United Nations refugee agency. The flooding also washed away tens of thousands of homes, devastated livestock and swept away farm land. The United Nations High Commissioner for Refugees said it has distributed 10,000 tents so far, along with other relief supplies which have assisted some 50,000 people in Khyber Pakhtunkhwa and Balochistan provinces. Speaking to reporters in Washington, Clinton stressed the importance of U.S. assistance to Pakistan, a strategically important country whose relationship with Washington continues to be a work on progress. The Obama administration is looking to turn the natural disaster into opportunity, hoping a robust response to the crisis will help improve its poor image among a skeptical Pakistani public. A senior Pakistani military official told CNN that six U.S. helicopters landed at Ghazi airbase Wednesday near the village of Tarbela Ghazi, just north of Islamabad, to participate in the rescue and relief work. The United States has already committed $10 million in aid, and U.S. helicopters have airlifted flood victims and helped deliver critical supplies including temporary bridges and 300,000 halal meals, food that meets Islamic dietary law. "We've been working hard over the past year to build a partnership with the people of Pakistan, and this is an essential element of that partnership -- reaching out and helping each other in times of need," Clinton said. She urged Americans to use their cell phones to text the word "SWAT" to the number 50555 to make a $10 contribution to the U.N. refugee agency. The Pakistan Meteorological Department predicted more misery in the days ahead. As much as 2 inches of rain is forecast over the next two days for central Pakistan while scattered showers will continue to fall in the north. Rushing river waters could cause more flooding in downstream areas by this weekend, meteorologists said. In some areas, Pakistanis complained the government has been sluggish to respond. In a special emergency meeting Wednesday, Gilani said the government was doing all it could to address the crisis. People stranded in Tonsa Sharif and Dera Ghazi Khan were still waiting for government relief, reported CNN affiliate Geo TV. Meanwhile, limited access to clean water and poor hygienic conditions raised the threat of widespread acute respiratory infections, diarrhea and skin infections, said the medical group Medecins Sans Frontieres (also known as Doctors Without Borders), which is supporting health units in Mandrakhel, Wadpaga, and Gulbela in the Peshawar district, and the Paddi Hospital in the Nowshera district. Collapsed bridges meant the medical teams were unable to reach the badly hit North Swat region. A case of cholera has been confirmed in Swat.